fresh inc alum Meghan Yankowskas has been working alongside some other alum since she attended in 2015. 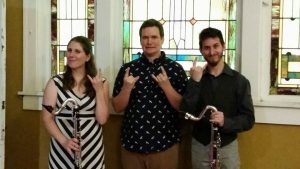 In April 2016, she premiered a piece for solo clarinet entitled “Beautiful Dead Insect” by Aaron Israel Levin (2015 alum) at Grinnell College. You can find a recording by following this link. Back in August 2017, she also collaborated with Eric Salazar (2014/2017) and Daniel Harrison (2015) on a concert at the Grove Haus in Indianapolis. They performed some of their own works and premiered a bass clarinet duet entitled “Steps Retraced” by Daniel. You can find a recording by following this link.